This is a thoughtful interactive piece of Ayumi's from The Democratic Cup (click on that to read more). The Democratic Cup is a collaborative idea involving over 30 artists who contribute cups, meant to "encourage person-to-person civil conversations about social and political issues*" over coffee. The idea is about "dignity and inclusivity*". (*Quotes are from The Democratic Cup website.) Ayumi's own website reads, "The mission of The Democratic Cup is to support and promote civic engagement. ...Democratic and familiar, the coffee cup is the perfect object to act as a catalyst for social change and true dialogue." 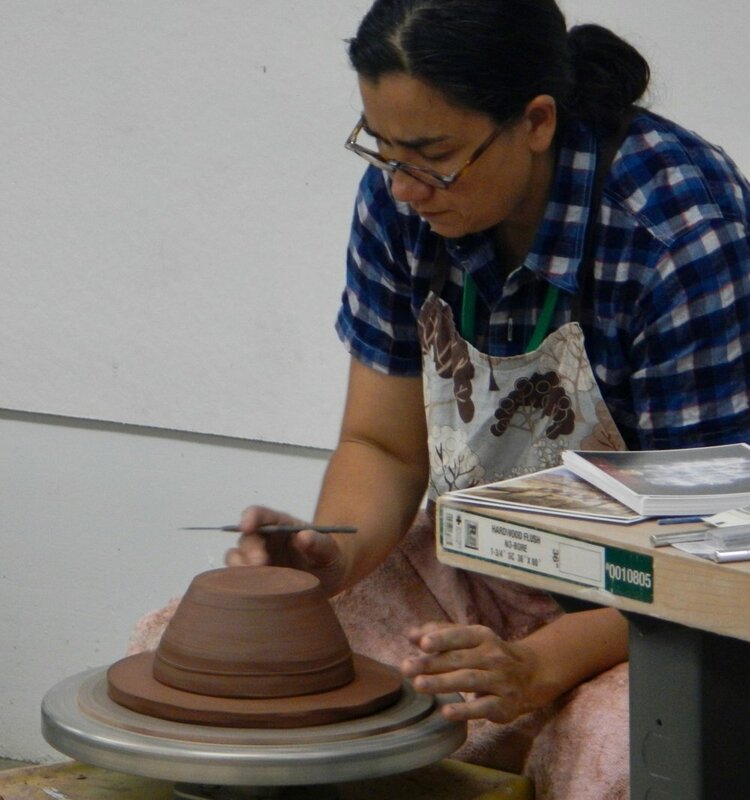 She talked about another idea she works with, Pots in Action*, or #PIA. People around the world own her pots. They send her photos of the pieces in use in their own homes. Until recently, photos of pottery was nearly always presented as photographed against a simple photo backdrop, lighted a particular way. I was taught to take my photos as I see photos in American Craft or similar magazines. But that is changing, and Ayumi is charting it on a map on her web page (*click on the link Pots in Action*, above). Brilliant. As Dr. Frankenstein said when he created the monster, "It is aliiiive!" I think Ayumi has taken the placid out of pottery. 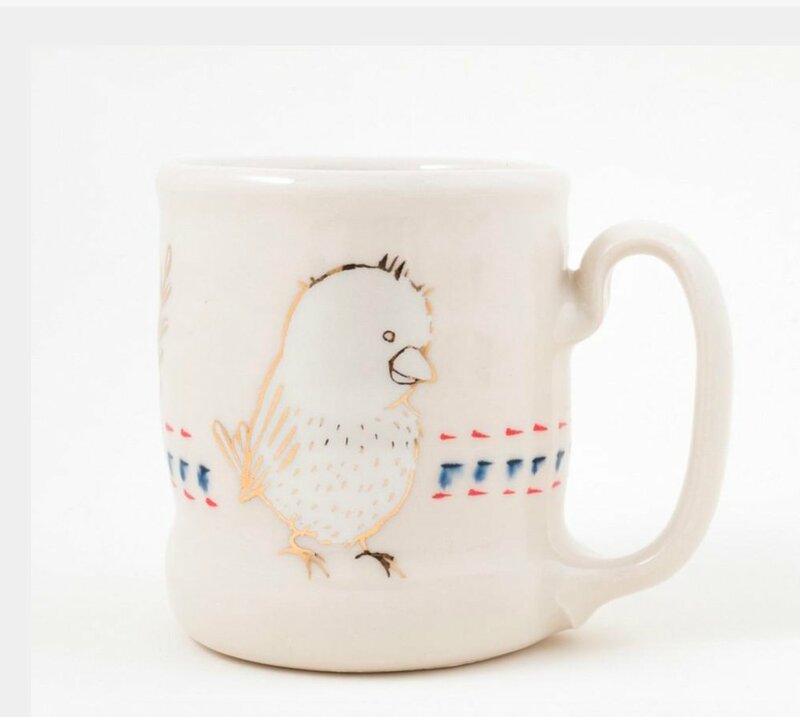 The cup below is a different one than mentioned above, but it has a form you often see in Ayumi's cups... and it has one of those birds (painted in luster) with the fuzzy head, that makes me laugh. Each of the presenters at the WWWC Symposium led a breakout session on one of the afternoons. Ayumi's was about how to connect our creative work with social issues. The people in the room didn't come up with any group idea of how to change the world in one hour (that would have been better than major governments manage, but no, alas), but some became emotional talking about how much they would like to do something. I can speak only for myself; I came out of it thinking about how I might do more, but the opportunities will come singly and slowly, I'm sure. All the presenters showed us their techniques of "making" as they talked and chatted with us. I have to mention Ayumi's throwing in particular, because it gave my throwing-brain a nudge, right in the paradigm. When I throw, it is with plenty of water to start, then using muscle and practiced moves to open and throw the piece while keeping it all from going off center. My jaw may have dropped to see Ayumi make a bowl, because she just did away with parts of the making process that have been in my repertoire of wheel work for decades. She took a two lb. (or so) piece of clay, and patted it more or less into the center of the wheelhead- till it was roughly but by no means exactly centered. Then, pressing down into the middle of the clay with a large, thick steel rib, she opened the whole interior of a bowl with no water, only pressure. The exterior of the bowl, meanwhile, was still uneven, never having been properly centered. She used a sharp tool (-wooden knife?-) to simply pare off a large, uneven ring of clay around the exterior of the bowl. This way she centered the exterior of the bowl and got the exterior of the wall finished enough to trim- just like that. Pared away in a flash. And then- because no water was used to throw the bowl- she just trimmed it a bit more while it was upright. Just a little later, the bowl could be turned over onto a pad of soft clay and a foot trimmed. And then contrasting slip or underglaze could be immediately applied, because the bowl had never gotten wet and too soft to work on further. What was mind-bending about the technique I've just described is that it was a way of throwing I've never seen before, even after 32 years of clay. And it was all-in-one. No waiting around to get back to it. No dragging out the process over a couple of days. I'll be glad to follow the work and career of this potter over time. Posted on July 24, 2017 by Mimi Stadler.